#ElyHour is what is formally known as a Twitter chat, but in reality we are much more relaxed than most Twitter chats. There are no rules, restrictions or guideline topics. We just get together on Twitter on a Wednesday evening between 8:00 and 9:00pm to say hello, share our successes or niggles of the week mixed in with a little bit of promotion for our individual businesses. It’s mostly small business owners and freelancers that join in – but that’s not to say that others aren’t welcome. I started #ElyHour in June 2016 and we now have almost 400 followers. I wanted to build a network of local businesses but I’m not comfortable with the traditional idea of networking (standing in a room full of strangers is soooo not my idea of fun!) but because I also don’t have full time childcare, getting out to breakfast meetings or post work drinks just isn’t practical for me. 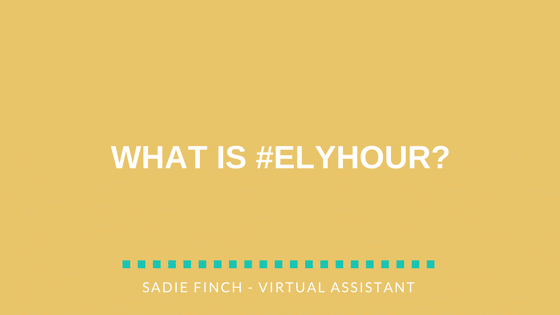 I knew I needed to get my name out there, but I needed to be able to do it from home… and so #ElyHour was born. It’s about conversations, getting to know one another and building relationships. We’ve already had many success stories from #ElyHour and would love for you to be a part of it too! Hopefully see you on #ElyHour soon! PS – I hope I’ve explained this all clearly, but if you have any questions feel free to connect with me on Twitter and drop me a message, or email me at sadie@sadiefinch.com.